Yesterday I gave you the opportunity to guess my new fitness goal. I said it was a hard one (it really, really will be), but not impossible. A few of you guessed. Some were close. But Jay from over at On a Jam Hunt hit the nail on the head! 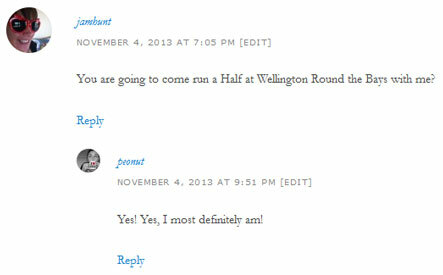 I’m going to run the half marathon at next year’s Round the Bays. 23 February 2013, just under 16 weeks from now. They’re two very different questions, both of which I answer with “Yes… but I’ll have to work my arse off”. I’m working to cover the distance. Not get an awesome time. Not to win (like that will ever happen). But to finish it, and know I can do it. I’m doing it for me. And that makes reaching the goal – keeping the motivation high – that much easier. Here’s to an interesting few months! Ha! Thanks for the mention. Plenty of time! I’ll be slogging it out too, really can’t wait! Good luck with your training, it’s going to be a blast! yaaaaay!! good luck with training, keep us updated!! Ahh good luck with training! Keep the updates coming, you’ve got this! You can do it! Loads of time to get ready. Regular training and lots of small goals worked for me. Good luck! You got this!! You go girl! It sure won’t be easy for a lazybones like me. Hearing stories from people who’ve reached their goals makes it feel so much more realistic. Thanks! Awesome! I pray you all the success on your journey!! The feeling at the finish line when you achieve this goal is going to be unbelievable. Enjoy every step along the way, too! Good luck with the preparations for your half marathon! It’s a great feeling knowing you can run for that long.. And if I can do it, so can you! And in Wellington, even.. Wow 🙂 Great city, lovely country. Hope to be back there someday..